Fifty years after first contact, the human race is beset by deadly machinations of several human factions as they struggle to extend their reach into the greater galaxy, A mysterious alien race has emerged whose ultimate intentions are as obscure as their origin. Each vies with the others to direct the future of our species among the stars and only you can determine the outcome. What is a Tactical Game System? 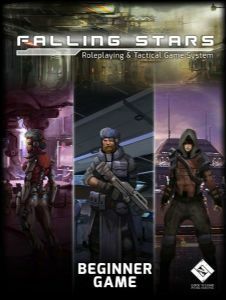 A tactical game system allows players to skirmish one-on-one with each other using the Falling Stars Opposed d10 game system. Players can take a break from role playing (or completely ignore that aspect of the game) and simply enjoy fighting other players. Players can select teams or elect to play free-for-all or anything else in between. The maps in Falling Stars are scaled perfectly for 28mm miniatures, or players can make their own maps using half-inch grid squares or as a miniature gaming system with ranges measured in half-inch increments. Maybe that tough talking UPAS marine thinks he can take your brawler. So take a break for the RPG and let the two players settle the argument with the Tactical Game System. Bragging rights goes to the winner, and then the group can get back to playing the role playing game. The possibilities are endless!